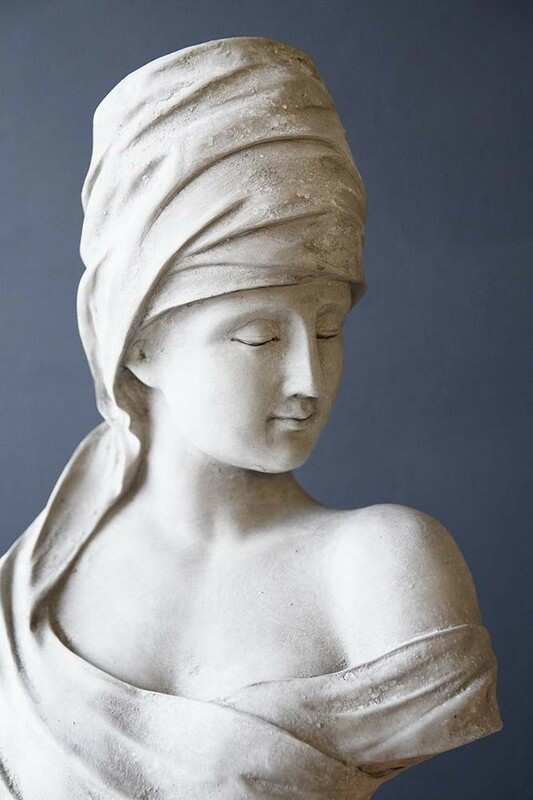 A decorative display piece for your home the stone effect Roman Greek Style Lady Bust is a quirky lady statute that will inject personality into your décor. 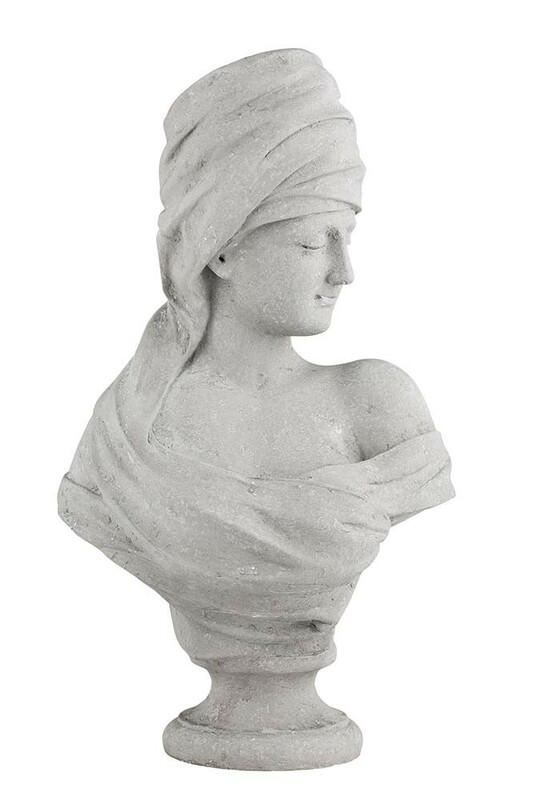 Featuring a grey stone serene lady wrapped in a toga with her head turned to the side and slightly raised on a stand the Roman Greek Style Lady Bust is available in a striking black or stone grey. The Roman Greek Style Lady Bust measures 28cm (length) x 18cm (width) x 49cm (height) and is made from polyresin. Out of the ordinary display ornaments and decorative pieces will make your home feel personal. So take the time to source and curate collections of things you love. If you remain faithful to the pieces you love your interiors will be timeless. So if you love roman and Greek statutes then why not have them in your home? It’s utterly unique and totally one-of-a-kind! A really beautiful decorative bust we think you’ll love the traditional Roman Greek Style Lady Bust because of its eclectic charm. Reminding us of roman or Greek statutes bring a little history into your home which is particularly great for adding depth to contemporary interiors and eclectic charm to maximalist interior styles. 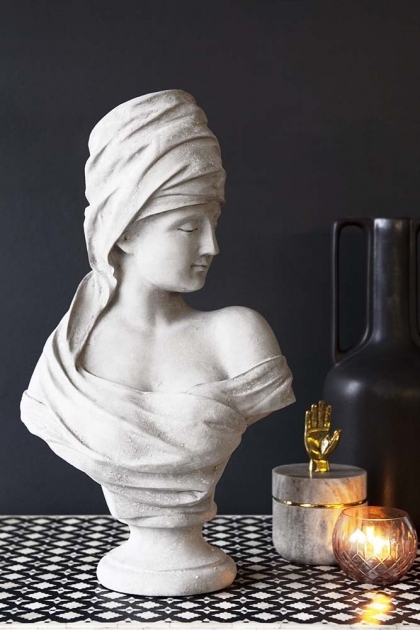 A fabulous display piece for your living rooms, kitchens, hallways, offices, bathrooms and bedrooms there really is no limit to where you can style the Roman Greek Style Lady Bust in Black. However, we think that she would look particularly fantastic next to your fireplace surrounded by pillar candles or adorned in fairy lights. But, if you really want to be original with your home interiors you could even display the Roman Lady Statute in the centre of your dining table. Surround the Roman Greek Style Lady Bust with flower pots and vases filled with flowers, candlesticks, quirky display pieces and tealights which will create interesting textural layers, dimensions and interest on your dining table. A great way to make your home interiors extraordinary! You could also check out the Rockett St George book: Extraordinary Interiors: Show Stopping Looks For Beautiful Homes, which is packed full of down-to-earth and friendly advise about styling and displaying your ornaments, accessories and art.